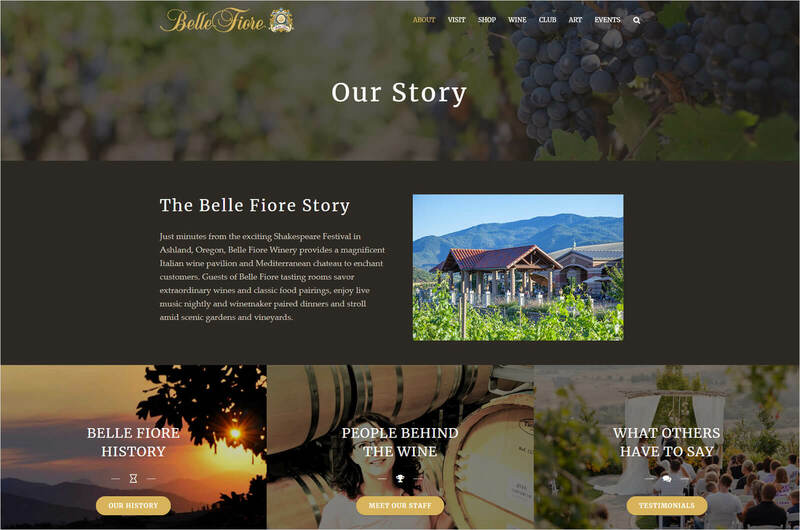 Belle Fiore Vineyard is like something from a Cinderella dream. Nestled at the base of the Cascades just a few miles from Ashland, this expansive vineyard has it all — a lavish French Chateau, an enormous Italianate Wine Pavilion, gorgeous grounds with stunning views of Pompadour Butte, Pilot Rock, and the Siskiyou mountains. And of course, an abundance of fine wine and food pairings. The website shows the story of the vineyard, with breathtaking photos of the architecture and setting. Meet the people behind the wine, learn about the estate club, and view the art — including a competition for art featured on the Belle Arte label. A robust event calendar overflows with music and dinners, and one can also find information about hosting private events and weddings. Such a pleasure to work on this gorgeous website with the dynamite team at Belle Fiore!